71024 Disney Collectable Minifigures Series 2 contains an exceptionally popular selection of characters, representing varied eras of Disney animation. Part two of our review comprises three such eras, beginning with Chip and Dale before discussing minifigures which are based upon Aladdin and Frozen! The chipmunk characters of Chip and Dale are probably best known for Chip 'n' Dale Rescue Rangers which began in 1989, although they originated during the 1940s. This minifigure takes inspiration from that earlier appearance, lacking the leather jacket and fedora which he wore onscreen for the Rescue Rangers series. It looks brilliant though, featuring a dual-moulded head which is manufactured using hard plastic and captures excellent detail. Chip's torso is simply decorated with some tan fur, although this does not match the colour on his head which is disappointing. The tail on his back looks superb though and I think the articulated medium legs suit this character, loosely replicating the proportions of his animated counterpart. The figure carries an acorn which is cleverly constructed using a piece that initially represented a Mandrake root and a dark brown 1x1 round tile with a vertical shaft on top. Dale also includes medium legs which have not appeared in medium dark flesh before and his torso appears familiar, featuring designs which are almost identical to those on Chip. However, the head is unique and looks fantastic when compared with the source material, featuring prominent canine teeth and a large red nose. The tousled hair between Dale's ears also demonstrates great attention to detail. Introducing additional colour with the character's Hawaiian shirt from Chip 'n' Dale Rescue Rangers might have been interesting, although the classic design looks wonderful too. 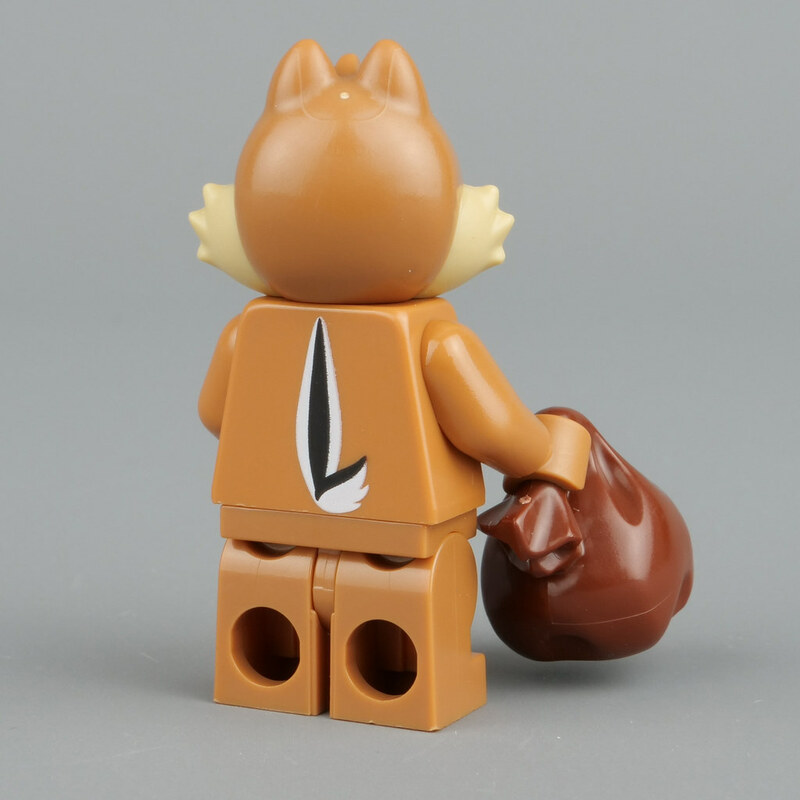 The minifigure comes with a reddish brown sack which is new in this colour and presumably contains some acorns! 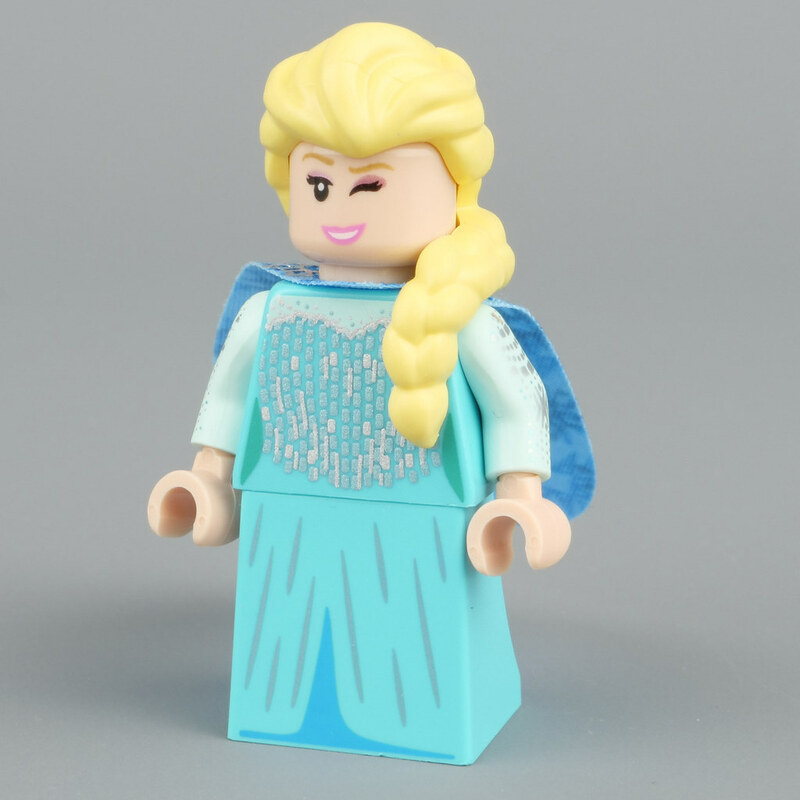 Frozen is among the most popular animated movies ever released and its main characters, neither of whom have appeared in minifigure form before, are both available in this series. Elsa wears a medium azure dress which corresponds with the film and looks lovely, featuring metallic silver highlights across both sides of the torso along with intricate arm printing. A skirt piece represents the lower half of Elsa's dress and this is also printed with silver creases. However, my favourite aspect of this minifigure is definitely her spectacular cape! Numerous blue and metallic silver snowflakes adorn this fabric component, giving the illusion of a layered design to match the film. Unfortunately, the cape does not hang naturally but creating a simple fold will solve that issue without spoiling the design. 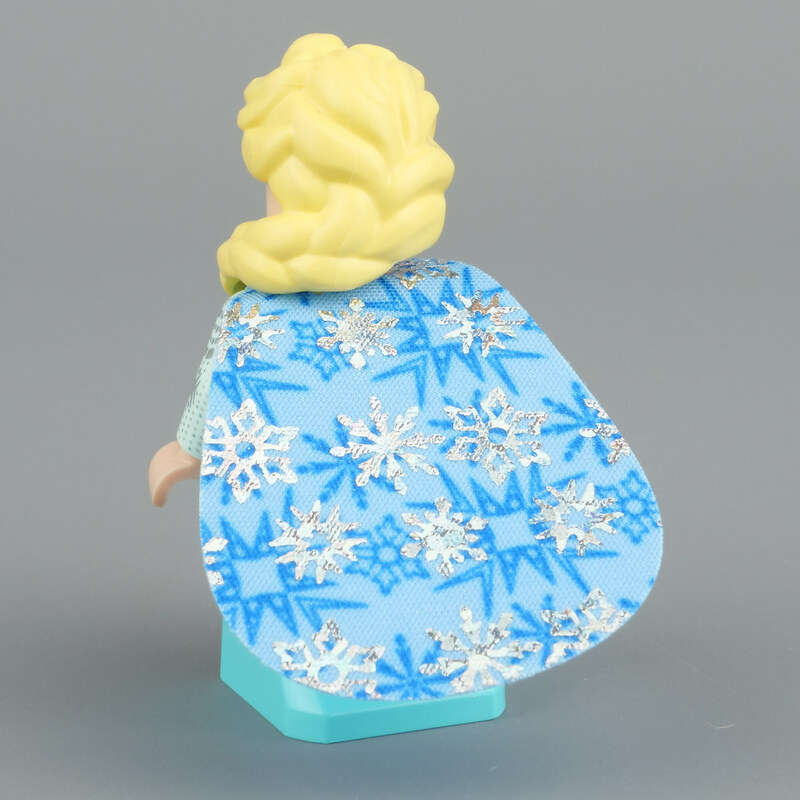 Elsa's rubber hair piece represents a considerable improvement over the previous mini-doll rendition, including the distinctive braid over her left shoulder and realistic texture. Her head includes a smile on one side and a winking expression on the other which is fun, although an angry or frightened face may have been more appropriate in relation to the movie. Anna includes similar facial expressions but they seem entirely suitable here, reflecting the princess' personality. The printed freckles are excellent and I love this dark orange hair piece too. A hard plastic element would have been preferable in my view, although that may not be appropriate for such narrow braids. 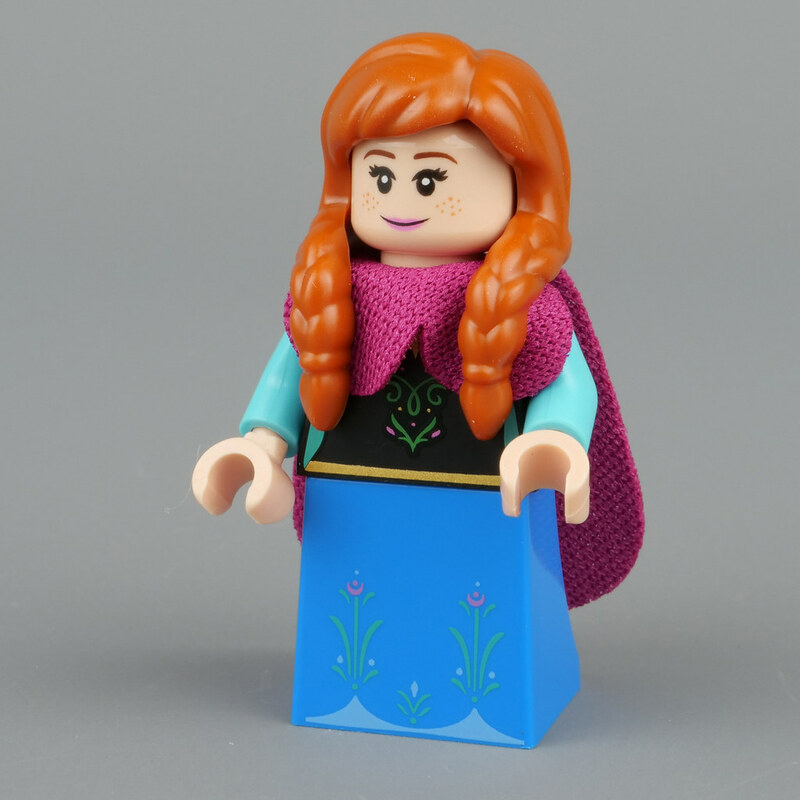 Moreover, the white highlights which are visible in Frozen are not present, perhaps because LEGO often avoids printing on rubber parts. The pink cloak is made from a soft material and compares favourably with the source material, even including shaped sections across the front. The torso features metallic gold highlights and scrollwork that looks brilliant and Anna's blue skirt is similarly accurate on the whole. It should not extend to the floor but no alternative component exists so I think using this one was the correct decision. Two characters from Aladdin appeared in the first series of Disney Collectable Minifigures and series two includes another pair, the first of whom is Jafar. The villainous Grand Vizier sports an impressive dual-moulded headdress which looks absolutely fantastic, featuring a shining ruby and a feather at its centre with a couple of decorative golden streaks on either side. This component lines up neatly with the shoulder armour underneath, although the latter part originally appeared in the NINJAGO range. Jafar's head includes two different expressions and these both seem accurate when compared with the animated film, due primarily to his arched eyebrows which are a vital feature of the villain's design, revealing his arrogant personality. 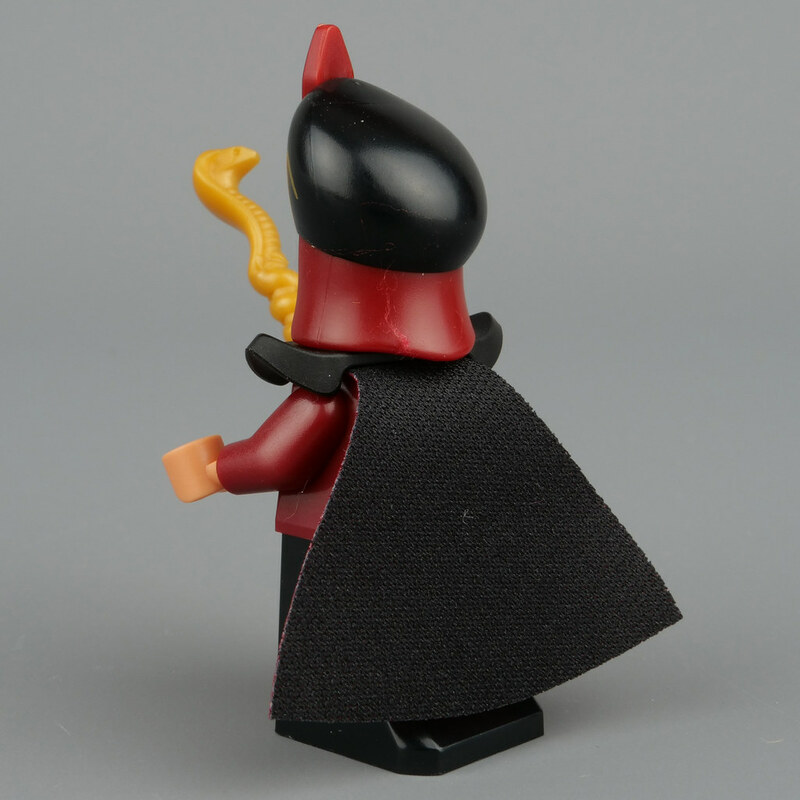 Jafar's torso appears relatively plain but no further detail is necessary in my opinion and I like his dark red and black cape too. 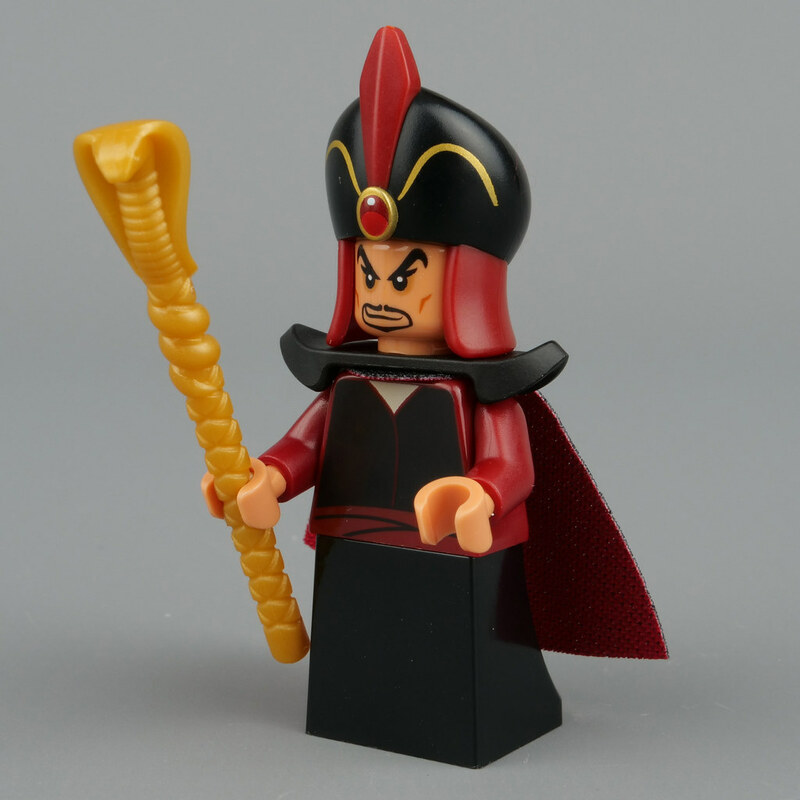 The minifigure wields a pearl gold staff with a cobra-shaped headpiece which was created for the Pharaoh from the second series of Collectable Minifigures. Nevertheless, it looks excellent and one could certainly imagine it was designed specifically for Jafar! 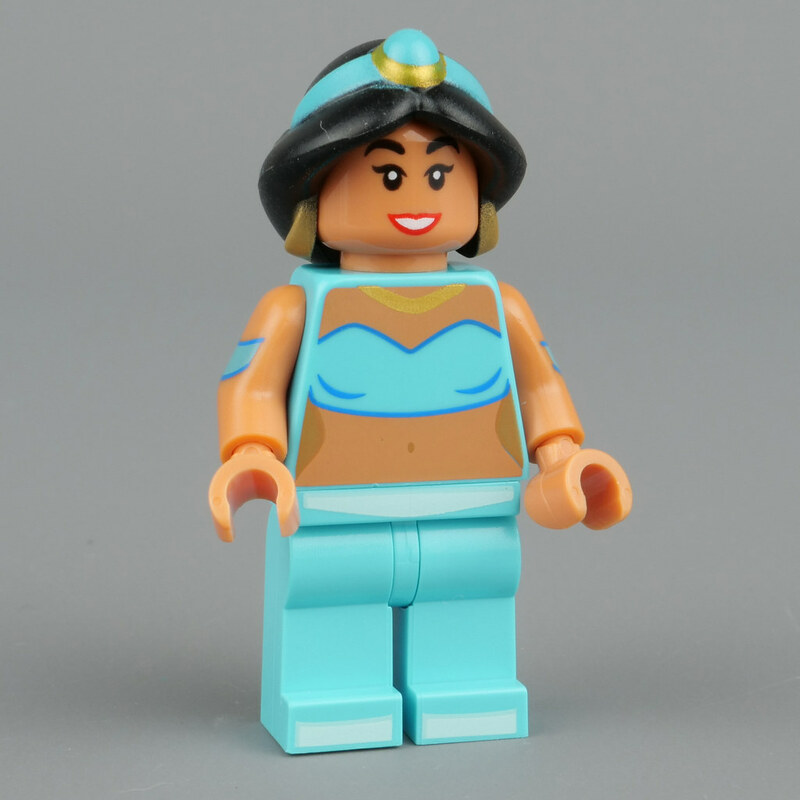 Princess Jasmine completes the central cast of Aladdin and this minifigure is based upon her most prominent attire in the movie, consisting of a medium azure tube top with corresponding sleeves and trousers. That design is recreated faithfully but LEGO's current printing technology does not allow the sleeves on each arm to connect with Jasmine's tube top on her torso, unfortunately. Furthermore, the minifigure only includes one facial expression which is somewhat disappointing, even though this smile does look reasonable. The hair piece has previously been used for mini-doll versions of this character and I believe it would be difficult to improve upon this part, which includes exceptional moulded detail. However, I favour hard plastic pieces. Jasmine is accompanied by a dove, taking inspiration from a scene in which the princess releases several birds from their cage. This element was introduced in 41161 Aladdin and Jasmine's Palace Adventures and it looks great, corresponding in scale with other animals and the minifigure. 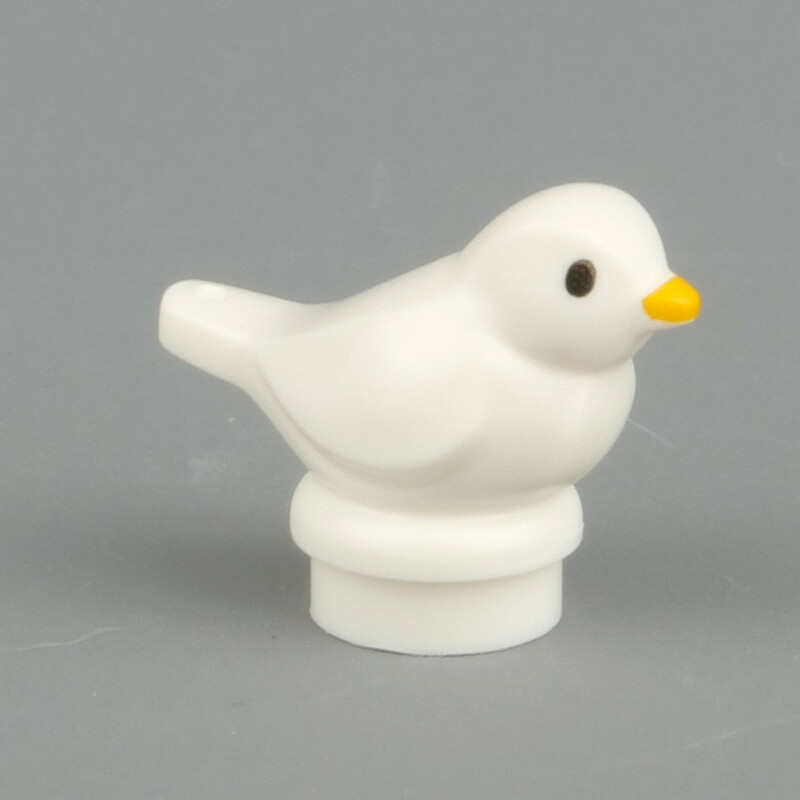 Its eyes and yellow beak are simply decorated but these small highlights are adequate. 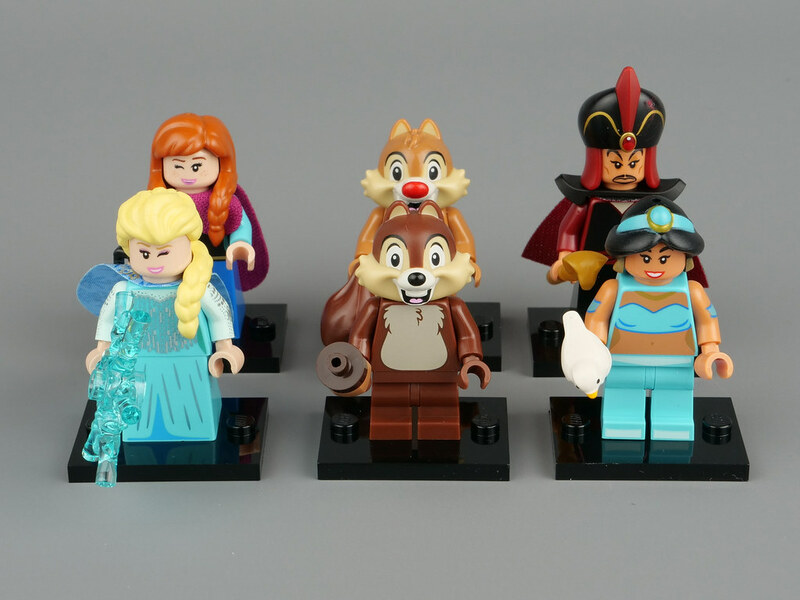 71024 Disney Collectable Minifigures Series 2 continues to impress! Chip and Dale both look fantastic when compared with their early animated counterparts and I like both characters from Aladdin as well. 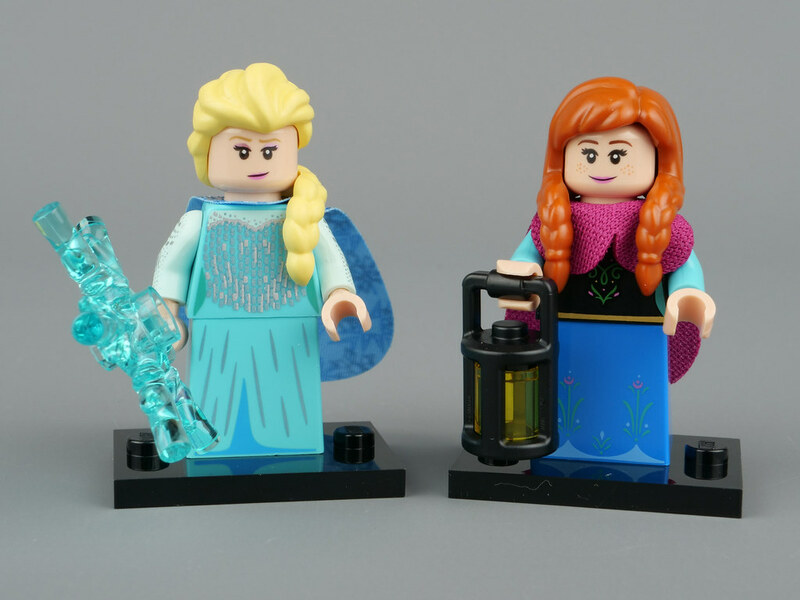 However, I think Elsa and Anna might be my favourite minifigures from across the whole series. They are both remarkably detailed and look incredibly accurate in relation to Frozen. I hope you have found the second part of this review informative. Let us know by liking this article and share your opinion about the minifigures in the comments below. Part three will be published shortly. Thanks to Huw for providing the photos in this review. Itching me to say the thumbnail for this article alone sold me on this series. Look how awesome these all look together! 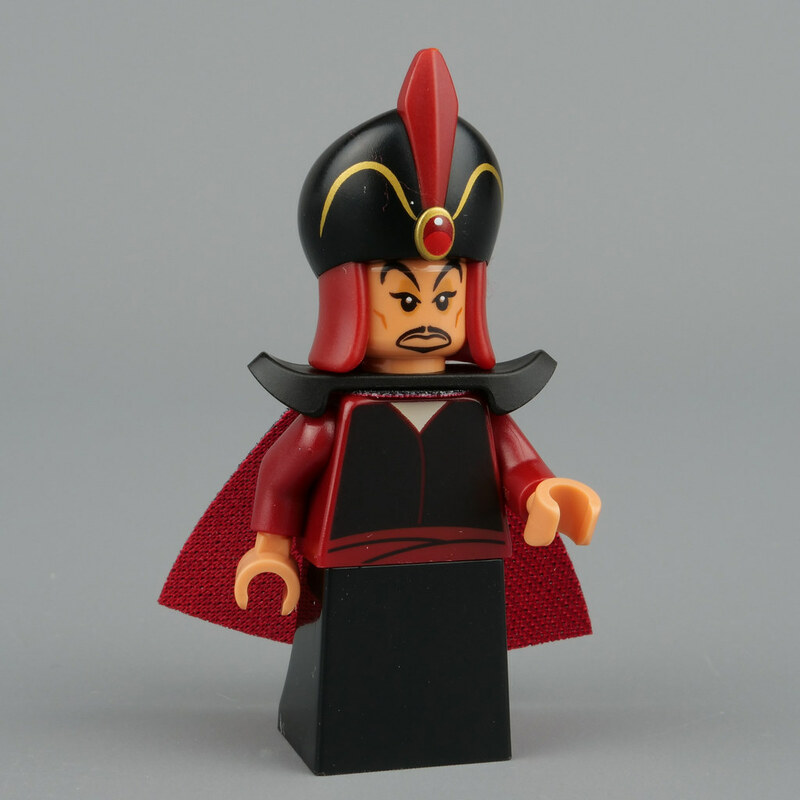 So pleased we’re getting a Jafar minifigure! Anna, Elsa and Jasmine feel kind of redundant considering the Disney Princess line exists, but they’re still very nice additions regardless. Fingers crossed we get the Goofy and Pluto minifigures many of us are after one day. 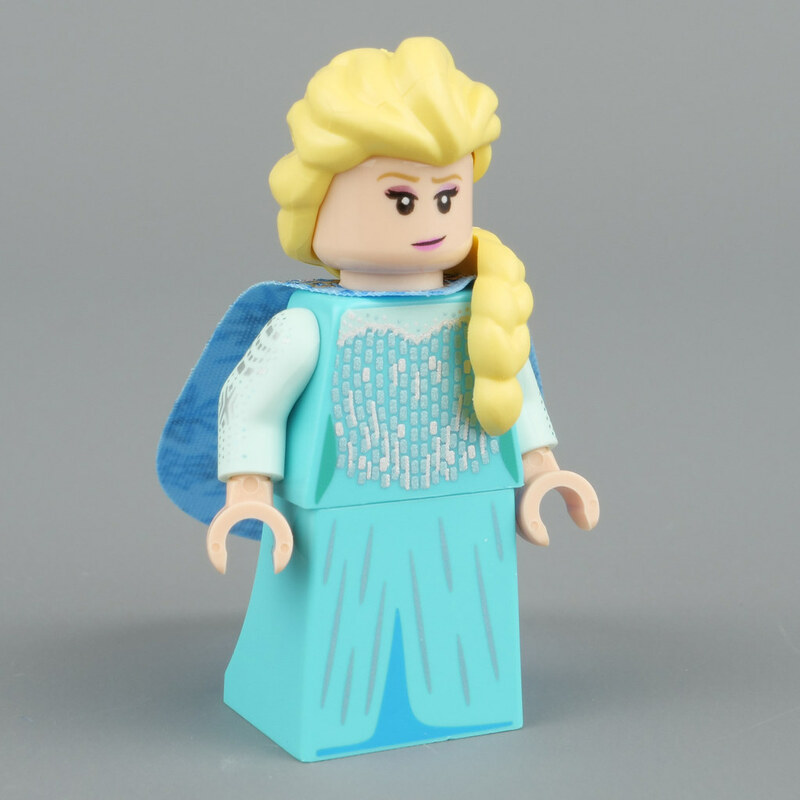 Would themes like Disney Princesses, and Elves, be more popular if they'd included the more widely 'accepted' minifigs, like these, rather than minidolls? I love all 6 of the figures reviewed here, I love the build for the nut with Chip a very creative use of two quite new parts. Elsa and Anna look very good and Jaffar and Jasmine look outstanding. I'm excited to get all 18 of the figures in this series. There actually was another option for Anna's skirt. Since it hangs fairly straight, they could have easily just given her regular legs and a cloth skirt. 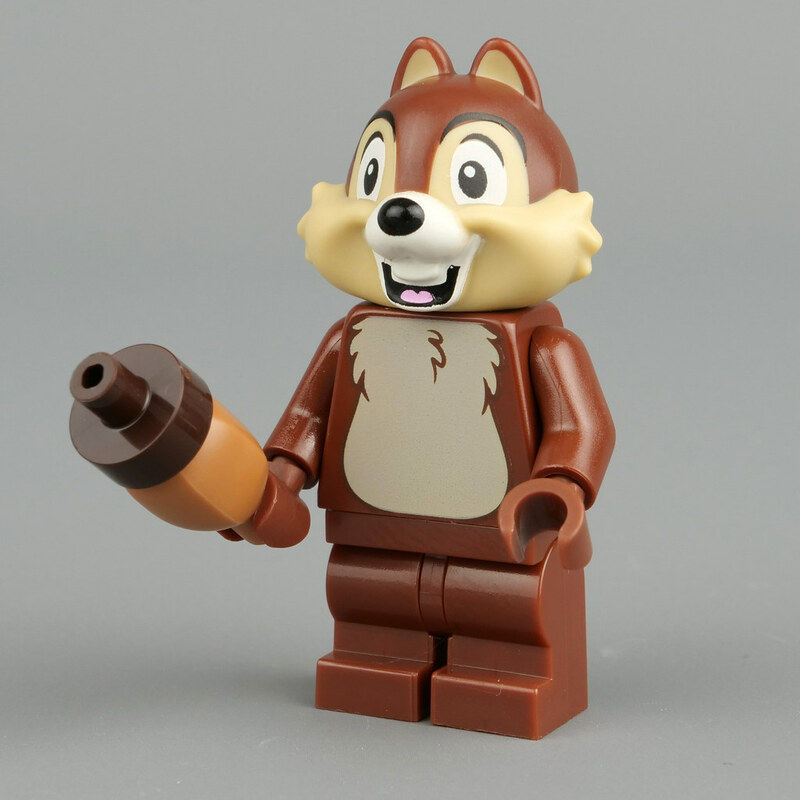 I remembered Chip and Dale having the same color of fur, but apparently that was only for Rescue Rangers, while in the old short films they do look pretty much exactly as depicted with this minifigs. Jasmine only getting one face makes the release of _three_ different promo shots of the character make even less sense. This series makes me wish lego would start making non-minidoll Disney sets! It’s interesting that Chip and Dale have different molds. I can understand different printing but a altered mold was the extra mile. Frozen: no no no no no no no no no non definitely not je refuse and no. Chip and Dale should have gotten a tail piece. Okay I have to admit the Jafar figure is pretty awesome. If he came with an Iago parrot accessory, he would have to be up there for the best minifigs of 2019. Jafar's cape would be great for infinity war Thor! Aragon's is ideal, but more expensive. The Chip and Dale animated shorts are way better than Rescue Rangers! "However, hard plastic pieces are preferable…" Says who? A lot of the reason LEGO even uses softer plastics for pieces like Exo-Force hair, Legends of Chima mammoth tusks, Yoda/Dobby heads, various Bionicle and Hero Factory weapons, etc. is that it would be impossible for parts like this to meet quality standards in harder plastics due to having thin or sharp parts that would be likely to break. What's more, SBS (the main type of rubbery plastic LEGO uses) is considerably more expensive than ABS. It seems kind of counter-intuitive to treat these elastic materials as lesser quality than cheaper plastics like ABS that are too brittle to be viable for parts with thinner or pointier shapes. I'd much rather have hair and headgear pieces that have an unknown chance of loosening over time over ones that I know from experience will break or bend irreparably if stepped on, like the the old Classic Space helmets and Castle peasant hoods, the original version of Qui-Gon Jinn's hair from LEGO Star Wars, or the flexible arm pieces from themes like Homemaker, Space, and Aquazone. @bananaworld: Doubtful. Friends has been among the five best selling LEGO themes every year since 2012 (others that have appeared in the top 5 during that time include Star Wars, City, Ninjago, Duplo, Creator, and Technic). In 2012, #3315-1 was the best selling LEGO set from any theme. In 2015, #41062-1 and #41101-1 were the best selling and fifth best selling sets, respectively. And in 2016, #41130-1 was the second best selling set. 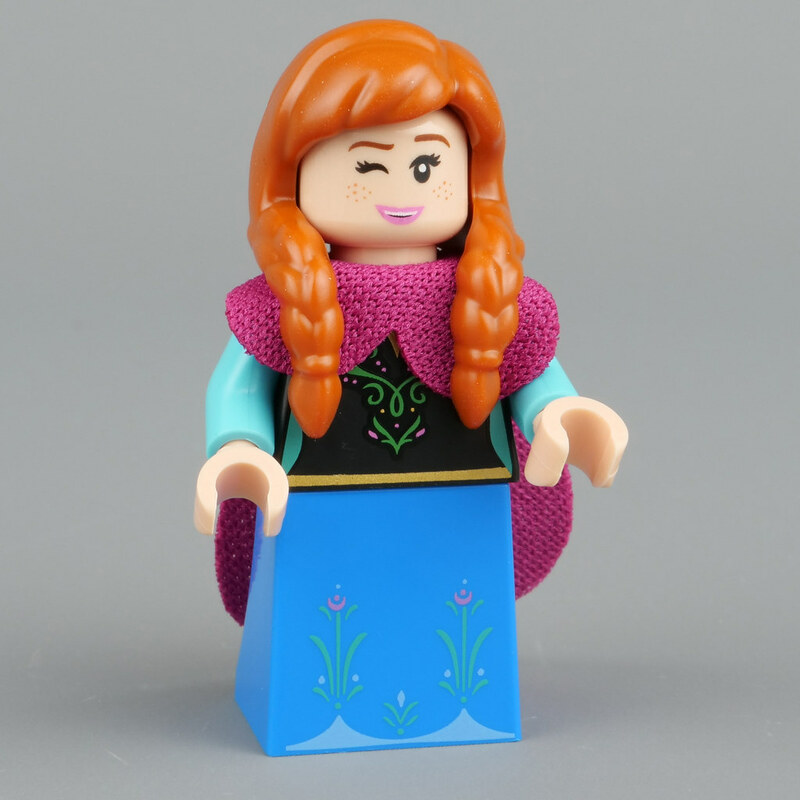 It's true that there are many kids and adults who prefer minifigures over mini-dolls, but there are also plenty who feel the opposite, and were never able to get into LEGO before the LEGO Friends theme. Reaching out to that audience that struggled to relate to the minifigure's blocky, abstract design was one of many things that allowed the LEGO Friends theme to become so successful without cannibalizing the sales of other existing product lines. So reverting to the minifigure in themes that currently use mini-dolls just seems like pandering to the majority-male audience that has always preferred the minifigure, at the expense of the buyers who mini-dolls were actually designed for, who helped make themes using them so successful, and who themes before the mini-doll never appealed to as reliably. @Majetta Rose: It's hard to know if I have any actual preference without having both hair pieces in hand, but I think it's easy to see why the mini-doll characters' hair pieces were designed differently. For one, these hair pieces seem to impede the rotation of the head and hair due to fitting snugly against the shoulders. And a hair piece designed to wrap around mini-doll shoulders this same way wouldn't have even been compatible with traditional minifigures due to minifigure shoulders being wider, higher up, and having squared-off corners. Considering that all mini-doll hair so far tends to hang from the back of the head and not wrap around the shoulders (even for characters whose hair does wrap around their shoulders in the source media), I think this is a conscious decision on the part of the designers. It's kind of ironic how often detractors of the mini-doll criticize its limited articulation, but don't seem to care that the traditional minifigure equivalents of many of the most widely used mini-doll parts (gowns, skirts, mermaid tails, longer hairstyles) tend to limit posability a great deal compared to their mini-doll counterparts. Just out of curiosity, I checked and there have been about 42 female Disney mini-dolls. Only five of them lack articulated legs due to having octopus tentacles or a hoop skirt. The rest (all with skirts, full-length gowns, or mermaid tails) can bend their legs/tail 90 degrees in front of them. By comparison, only six of the female figures released as mini-dolls so far (the three versions of Jasmine, two versions of Moana, and Cassandra) would have any kind of leg articulation as minifigures, due to having short skirts instead of full length gowns. The other 36, like the Disney Series 2 Elsa, Anna, and Jafar figures, would have no articulation in their lower bodies whatsoever! I think which version most girls would prefer to play with should be obvious… something tells me Disney sets in which the vast majority of male characters have articulated legs and the vast majority of female characters do not might be a TEENSY bit alienating to people who primarily relate to the latter. Sorry for going on and on about this particular factor. Overall, I think this minifigures series is as strong as we've come to expect. The one thing that perplexes me is that Chip and Dale use full-length legs rather than short legs or even the medium-length legs that were recently introduced. After all, not only are Chip and Dale small characters by their nature, but proportionally their legs make up 1/6 of their total height or less! While the minifigure's legs are kind of stubby by default (less than 1/5 of their height as measured from the base of the hips piece), it just feels weird to see the same length legs being used for characters who have normal human proportions in the source material as for characters who are decidedly shorter. @Aanchir - I understand the practical purpose of rubbery elements but subjectively prefer those made from hard plastic. Chip and Dale do both include medium legs. @Aanchir: Chip and Dale do use the new medium legs. Compare Chip and Jasmine on the final image. I agree with you on the safety aspect, but I fully understand why people hate the rubbery hair because I share some of the same complaints. Nearly all rubbery hair has a really loose fit, with the Exo-Force hair (two of the first rubber hairstyles, I believe) having some of the worst. The S4 Punk Rocker mohawk would have had such a tenuous grip that they had to add a plug that grips the inside of hollow studs, making it impossible to use with old solid-stud heads. And the paint that they used for the colored stripes on the hair for Dr. Inferno and Dr. D. Zaster can be peeled right off with your fingernails, which makes it very easy to destroy some valuable minifigs. On the other hand, I've had need of that hairstyle in plain black and plain white, so for that purpose it actually worked out in my favor that it's so easy to take the paint off. Still, there are tricks that work on ABS that would simply destroy rubber, so even if they had made them in plastic I would have been able to strip the paint off. And speaking of which, this is another example of a rubber hair that has a very bad fit. I mean, there are ABS hairstyles, and sometimes specific colors for ABS hair, that fit pretty loose, but I'm not sure I've actually run across a single rubber hair that actually does have a good grip where it's simply not an issue for most ABS hairs and hats. 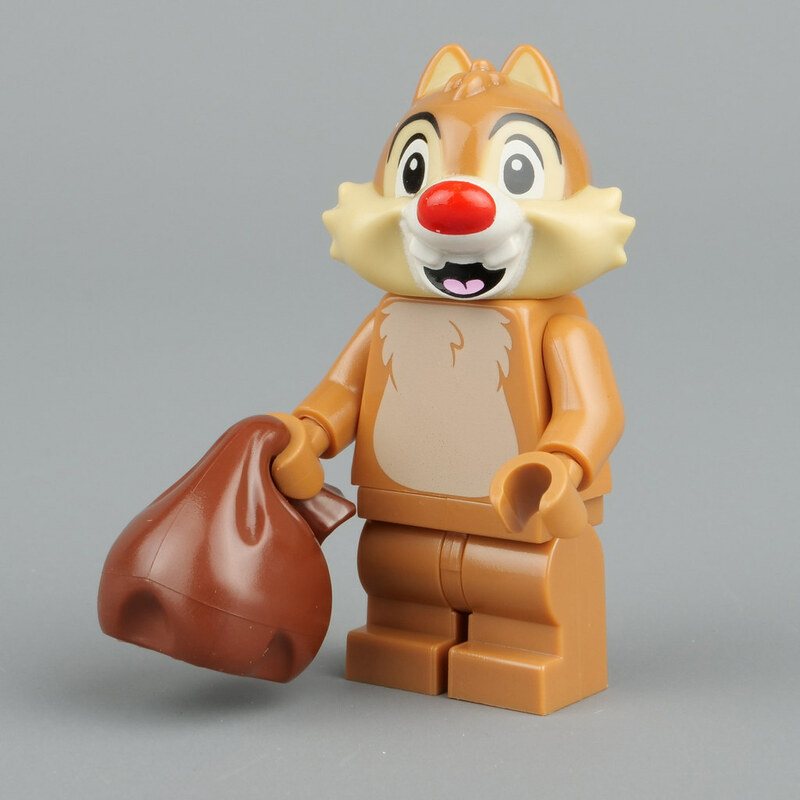 I would have much preferred Chip and Dale to have had molded tail pieces than a bag and simulated brick built walnut, other than that I love these and hope Disney and Lego make at least 10 more collections! I like how Jafar's headdress makes his head look thinner! Huh, Elsa and Jafar both look a ton better than I initially thought... they may end up on my wishlist after all! Elsa, in particular, looks simple but effective... and while I like her outfit from the recent Frozen 2 trailer better, I can also completely understand why it wouldn't have been feasible to adapt in time for this series' release. @Purple Dave Dr. Inferno was the first minifigure I ever got with rubbery hair. The printing was rubbed off within a week of play, mostly on the first day. Ever since then, rubber hair has felt pretty lame to me, but at least LEGO learned to stop printing on it. On the flip side, Elsa's hair here is one of the coolest hairpieces I've seen in a long time. I love it! Does anyone else think it's weird that Jasmine's torso is blue rather than flesh? I didn't realize it was _that_ bad. I built the volcano lair, filled it with every villain, and stuck it on a shelf. I never actually had to peel one of the Inferno hairs because there were plenty without paint for sale. I did have to peel a Zaster hair, but since it was going to be the first time I did that, I made sure to buy a couple just in case I ended up destroying one. Turns out the stripes all had a raised, rippled edge that was easy to pinch and peel, so the first one I pulled out of the bag ended up becoming an anemone for a small coral reef I designed. I just went and checked in on them, and while Dr. D. Zaster has clean edges on all three stripes, Dr. Inferno does have a small bit of edge on his rightmost stripe that looks a bit sketchy. Nowhere near as bad as the Zaster hairs I bought a couple years ago, but enough that I'll be very careful when cleaning them. Disappointed that there is no Iago included with Jaffar!!!! Okie wasn’t excited by Chip’n’Dale but after the close up photos might just have to add them as loved them growing up in pre-Rescue Rangers animations. Also, LEGO, can we get Kristoff, Sven & Olaf minifig format in, oh say, Disney CMFs Set #3? ??? ?